for instance, Tesco must develop a recommendation engine to first assess customer preferences, and then suggest likely purchases. IT must also figure how to deliver personalized electronic coupons to each customer, perhaps via a digital wallet stored in the cloud. Apps must be written that deliver personalized offers without discriminating among devices or connection type. Then there's the need for speed and agility in app development. Like the display window of a physical store, a retailer's digital window must be re-dressed regularly. Also, changes in devices can require revising mobile apps. "The rate of change in these apps and systems is phenomenal," McNamara says. "In the past, we might have upgraded financial software every four to five years. Today, we're doing a fairly major release — for phones, for the website, for in-store kiosks — every week or two. The rate of change and the complexity of the environment make this a completely different world." Tesco's Price Promise program illustrates both the risks and rewards of crossing the digital frontier. One way retailers can increase customer loyalty is by promising the lowest prices. For both online and in-store shoppers, Price Promise means that goods bought at Tesco will be price-checked automatically against comparable items at three major retailers. If the basket costs less at Tesco, shoppers will learn how much they saved; if it's cheaper elsewhere, they will receive a voucher of up to £10 (approximately $15.25). "It's our Price Promise: You won't lose out at Tesco," says David Wood, Tesco's U.K. Marketing Director. Retailers Bullish on Mobile Looking ahead to 2017, here's what retailers expect. 56% 42% 42% 41% 35% of all transactions will be completed via mobile point of sale, self-checkout at a terminal or on a shopper's mobile device. expect to send coupons based on a customer's location in the store. of sales will come from online, mobile and social commerce sites. expect to provide personalized product details, based on previous behavior, to a shopper's smartphone. expect to recognize their customers in the store with geofencing or presence technology. Tesco could soon offer digital personalized discounts for individual customers, says CIO Mike McNamara. Still, there's risk for IT. The rewards of programs like Price Promise can be realized only if the execution is flawless. First, Tesco must adopt processes and technology that ensure its prices are equal to or below other retailers'. Otherwise, the flurry of refund vouchers presented would quickly hurt the bottom line. Even more worrisome would be system slowdowns or freezes. Imagine a customer standing at checkout or ordering online; a short delay would be annoying, while a longer one could sour a shopper on Tesco forever. 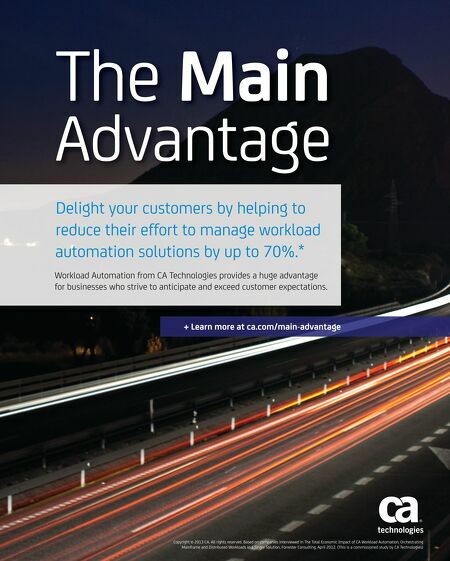 To help ensure that doesn't happen, Tesco uses application performance management (APM) solutions from CA Technologies. "APM tools are invaluable to us, as they provide insight into application performance," McNamara says. "Very small changes in configuration or consumer behavior can precipitate serious issues. So you really need to dive deeply to understand quickly what's going on and fix it. APM gives us that kind of insight." APM monitors application service levels, of course, but it also helps Tesco IT discover which subsystems, services and applications are the source of problems, even down to a faulty component or a suspect line of code. For example, McNamara cites performance glitches during the peak holiday season that would have been impossible to diagnose and resolve without the insight given by APM. A key benefit was the time saved and resources conserved as technical staff quickly restored compromised applications. Tesco's IT executives appreciate such productivity gains for the same reason they embrace cloud computing. Despite heavy involvement with customer-facing apps and mobility, IT is still responsible for process optimization and operational efficiency, and these factors directly affect the bottom line. In today's global village, IT needs to connect colleagues, suppliers and partners around the world for collaboration. The right security, infrastructure, automation and application management technology helps Tesco maximize IT efficiency, freeing resources for more strategic work. As de Rojas of CA Technologies says, "No retail CIO spends all their time talking to technologists these days. Most progressive CIOs will be fully immersed in the business, understanding how to deliver innovation and competitive advantage through technology." "Retailers first" is certainly the direction set by McNamara. Yet he believes Tesco, and the entire industry, still have far to travel toward the digital future. "Retailers should hold onto their hats," he says, "because in the next decade, the pace of change will be breathtaking." 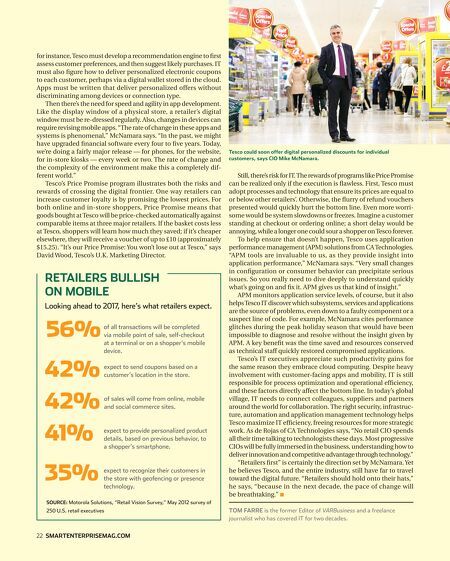 n Source: Motorola Solutions, "Retail Vision Survey," May 2012 survey of 250 U.S. retail executives 22 smartenterprisemag.com Tom Farre is the former Editor of VARBusiness and a freelance journalist who has covered IT for two decades.